This special vintage pen is a 1930 Waterman #7 “Yellow Banded” lever-filler in Red Ripple with the “Yellow ” cap band and corresponding nib. The Yellow nib is described as: medium “rounded, writes smoothly in any direction, suits southpaws” and right-handed writers as well. 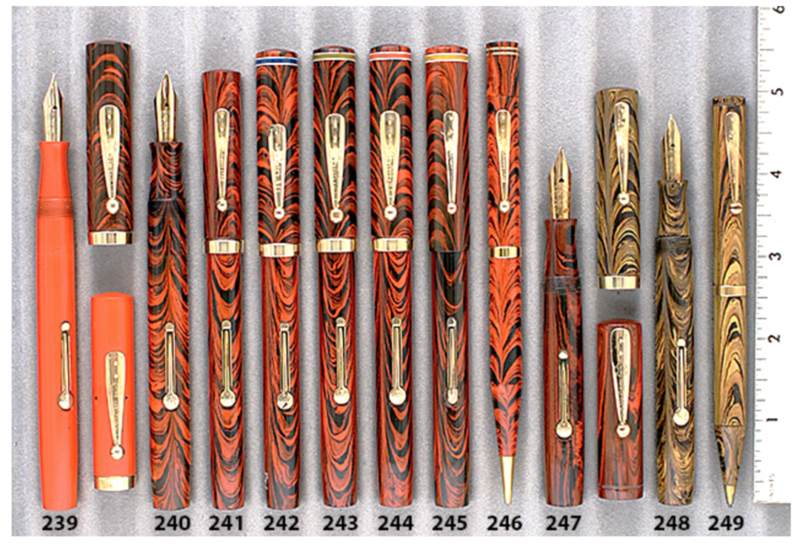 Waterman used a color-coding system so buyers could select their style of nib by ‘color’ – identifiable by the color-coded band on the cap and the label on the nib. It was their answer to Wahl Eversharp’s Personal Point pen. This vintage pen features gold filled trim. A very late version, with a narrower than usual clip, no cap band and a then new “shovel” lever rather than the “globe” lever. Made from leftover parts as Waterman was converting from hard rubber pens to Celluloid pens (with the introduction of the Patrician). A touch of clip ball brassing, otherwise near mint+. This entry was posted in Vintage Pens and tagged Catalog, Catalogs, Extraordinary Pens, Go Pens, GoPens, Nibs, Vintage, Vintage Fountain Pen, Vintage Fountain Pens, Vintage Pen, Vintage Pens, Waterman. Bookmark the permalink. Follow any comments here with the RSS feed for this post. Post a comment or leave a trackback: Trackback URL.